Each year millions upon millions of salmon return to the creeks, streams and rivers of Alaska to complete their lifecycle and spawn. Acting literally as the lifeblood of Alaska, rainbow trout, arctic char, dolly varden, grayling, northern pike as well as many mammals and birds all depend on this one event to sustain them through many rough winter months. Luckily for us too, it makes such an incredibly rich and diverse fishery possible. 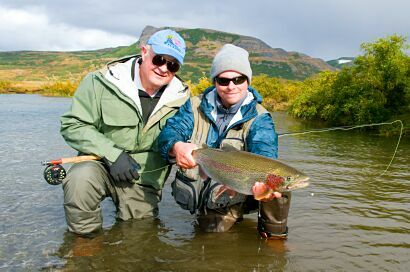 One of the most remote and beautiful areas in the world, fishing in Alaska is like going back in time. With virtually no roads, unparallel wildlife and spectacular scenery, beginning and advanced anglers alike will find in Alaska a primal connection with nature. Whether you choose a float trip through the Brooks Range and camp in tents or you prefer your own private cabin, the opportunity to fish and explore the Alaskan wilderness is a priceless experience.